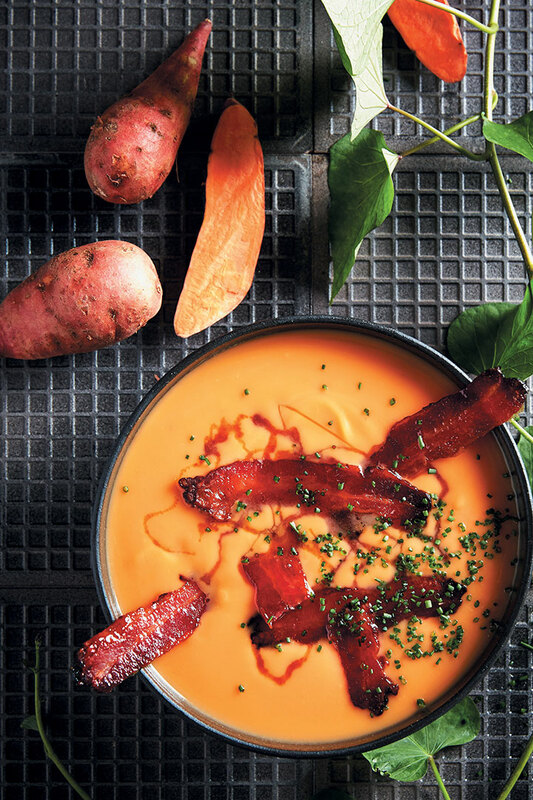 This sweet potato soup with maple and whisky-glazed bacon is the only way to beat the winter chill. It’s the perfect combination of sweet and salty. We love making a batch big enough to feed the family AND take some for lunch the next day. Serve with croutons or a slice of bread of your choice. Preheat the oven to 180°C. Place the sweet potatoes in a saucepan and add the orange juice and some water to just cover. Bring to a boil and cook until the potatoes are soft, 20 minutes. Allow to cool a little before transferring the potatoes and liquid to a liquidiser with the butter and orange zest. Blend until smooth, adding a little more water to make a thick soup. Season to taste. Lay out the bacon on a baking tray and place a second tray on top, so that it presses the bacon flat. Cook in the oven, 10 minutes, then remove from oven and take off the top baking tray. Combine the maple syrup and whisky and pour the mixture over the bacon. Return to the oven and bake until golden and sticky, 2 – 3 minutes. Spoon the soup into a tureen or individual serving bowls. Top with the bacon, drizzle with the pan juices and garnish with fresh chives.